When you’re driving your RV at night, the first thing you need is your headlights. This piece of kit is often overlooked yet it’s one of the most important features on your RV, meaning you should have the best possible headlights you can get. The following article will describe the various headlight upgrades that you can purchase and the many pro’s and con’s. 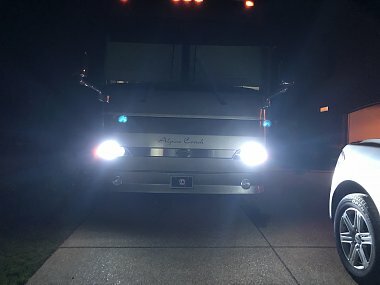 There are various benefits of having a great set of RV headlights. You should always take into consideration how important headlights actually are for all the situations you’ll need them in. The following section will discuss these benefits in more detail. The simple function of headlights is to allow you to see during night time or early mornings. A decent pair of headlights would allow you to navigate during any time and makes your journey far easier and less stressful being able to see. Just like the previous pointer, another use case for a great pair of headlights is that they make it easier to navigate through thick fog. We all know the struggle of having to blindly drive through fog with some of the weakest lights you’ve ever used, it’s at this point most people realise they need an upgrade. One of the biggest benefits is that they allow you to travel at any time throughout the day in any climate or weather. Being able to drive at any time is a huge benefit in the same that you can easily make up for lost time or just cut your trip in half by driving throughout the night when there’s less traffic. One of the most important sections on our article is the actual review of all the best product that are currently on the market. The following section will discuss in more detail the various pro’s, cons and features of these products. 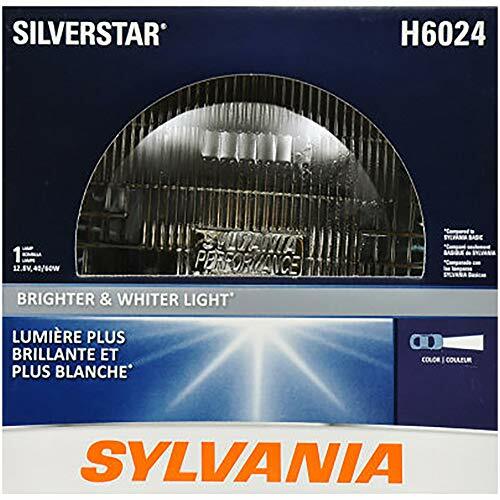 This bulb is your standard halogen bulb that comes with most other RV’s and cars. This modern headlight technology can provide your with a 50% more powerful low beam and 25% more powerful high beam. It has an aluminium case reflector that works to make the light far brighter and whiter than those older models of halogen light. Along with this they come with a one year warranty. Halogen headlights are probably some of the strongest and widely used headlights currently on the market. However, these updated models are 50% brighter when using low beam and 25% brighter when on high beam, a vast improvement from older models. This improvement is partly due to the aluminium casing that helps reflect the light back more efficiently. The product also has a one year warranty, these lights are probably the most robust so you shouldn’t need to use that warranty. The only downside is that these headlights are fairly basic and don’t offer a lot more other than navigating in the dark. The LED headlights have been growing in demand rapidly over the past 5-10 years. This is mainly because they last a long time, they’re more efficient and can be crafted into different shapes other than just a bulb. These lights are proven to reduce accidents on the road thanks their ultra bright LED chips and durable aluminium shells. These LED lights will last you up to 50,000 hours and have a color temperature of 6000K which is extremely bright for LED lights. Along with being bright, these lights are also waterproof and far more durable than HID kits. These LED lights are some of the most popular currently on the market. They last around 50,000 hours which is far more than any other type of headlight. This efficiency is also matched with being waterproof, this is expected from any headlight. This headlight is also rated at 6000 Kelvin which is on the higher end of the brightness scale, the whiter/brighter the better. The only downside that comes with this product is that LED lights are usually expensive. 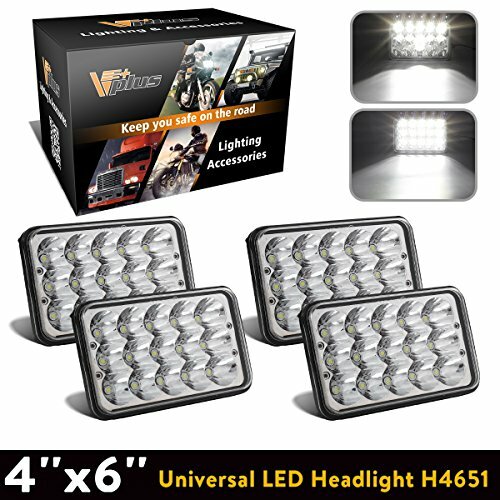 This pack of four LED headlights are far more efficient than the basic halogen headlights and can be used not only as RV headlights but spotlights and reversing lights. They boast a 50,000 hour lifespan and have plenty of different protections against dust, water and rough driving. These lights emit 4200 lumens on low beam and 2500 lumens on a high beam. The casts are made from high end aluminium for strength and durability. They have a slotted design for effective heat dissipation and a breathing hole to release any moisture. Having LED headlights is a huge benefit, they’ve got a long lifespan and provide a bright alternative to less efficient HID or Xenon lights. They’re surrounded by die-cast aluminium which helps to reflect the light to make it brighter as well as acting as a strong protective case. Speaking about protection, this headlight has a great protection against overheating and moisture. The only problem is that this brand of LED lights won’t provide you with the same brightness as previously mentioned brands. 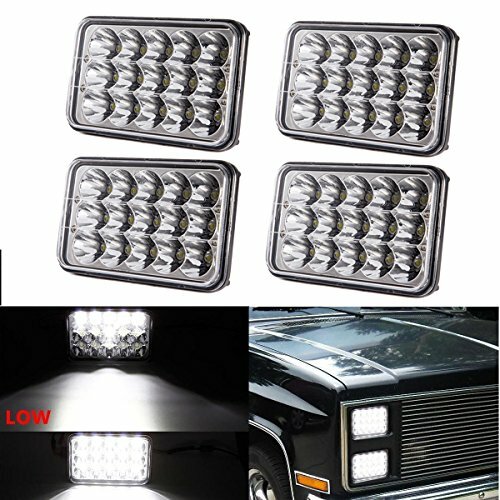 These four LED headlights are easy to install and require only a screwdriver. These LED lights provide you with a bright experience at around 6500 lumens on low beam and 3800 on high beam which is one of the highest ratings on this list. The 0.1 inch ribbed back is effective in dispersing heat, this was also along with the die-cast aluminium material that helped make the lights more reflective and durable. There is also a moisture protector built-in so that moisture doesn’t build up in the lamp. These lights are compatible with 99% of vehicles out there so you won’t need to worry about installation. This product is easy to install and won’t take longer than 10 minutes to quickly put them in and test them out. These are also some of the brightest LED headlights currently on the market. Because of the brightness and aluminum reflective casing, these lights also create a significant amount of heat which is dispersed fairly easily through the ribbed back which provides the heat somewhere to exit and for cool air to enter. The casing is also made to last and will survive any rough road trip. The only downside to LED lights are that they’re expensive, another thing for this product is that they moisture can build up easily if you haven’t installed it properly. The four piece LED headlights will help with your visibility in all situations whether that be in poor weather conditions or just driving throughout the night. The high beam offers 5600 lumens while the low beam offers 2500 lumens per bulb. 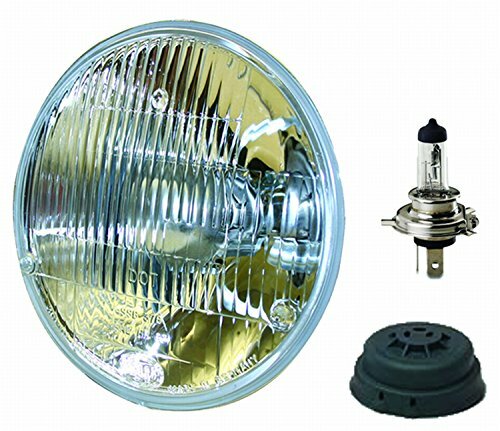 The headlights consist of 15 bright 3W LED chips made from a durable aluminium shell body which offers decent protection from the elements and those rusty drivers. The lights are also waterproof with an IP67 rating. The color temperature sits at 6000K making these lights fairly white. Just like most other LED lights they’ve got a life expectancy of 50,000 hours. This strong and durable LED headlight pack is protected by the die-cast aluminium shell that protects your lights from crazy driving, overheating and moisture. The diecast shell is waterproof with a IP67 rating. 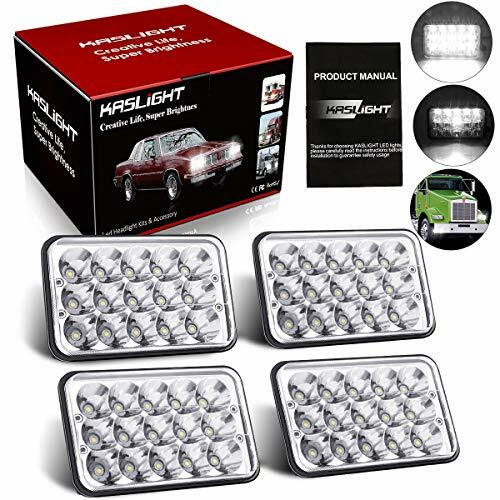 The brightness rating also sits at around 6000K which is extremely white lights, this is great for any headlight and should always be around this area. Like all LEDs they should be able to last around 50,000 hours. The only downside to these headlights are that the high beam and low beam aren’t as strong as the other headlights previously mentioned on the list. 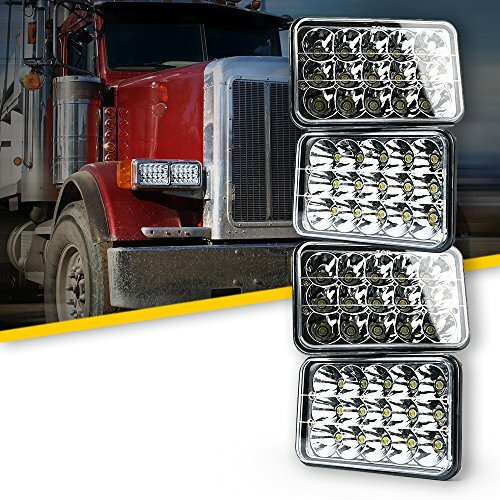 These high performance LED headlights come in as a pack of four. The headlights contain 15 high intensity 3W LED bulbs that will help you navigate during any weather or time of day. These headlights are sealed, waterproof and durable enough to survive any situation. These high performance LED lights are leagues ahead of their halogen counterparts. These lights should be able to last 50,000 hours if installed properly. They’re also easily installed on to 99% of modern vehicles and should be able to work on any RV on the market. If you run into some trouble, you’ll be covered with a full years warranty. The casing is one of the strongest on the market and should have plenty to offer in terms of protection against the elements. Like most LED headlights they’ve got a long lasting 50,000 hours ahead of them before they’ll need changed. These special lights are high-intensity which makes them brighter and far more effective in navigating through bad weather and darkness. They’ll almost certainly fit any RV on the market currently, as well as this another benefit would be the one year warranty. The only downside is that the plastic on the headlights can crack if you’re on a bumpy road or track. Another downside would be that moisture can easily find its way into the casing. 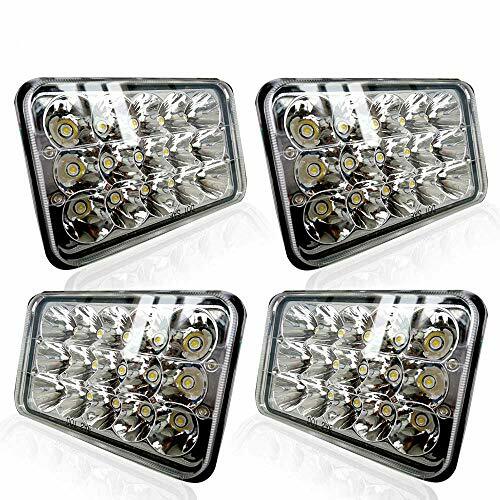 These four piece LED headlights are some of the easiest headlights to install on your RV. Their patent design will prevent fogging and moisture from entering the inside. The bright 15 LED lights can offer 4200 lumens on high beam and 2500 lumens on a low beam. There are all the same benefits of LED lights when you get these headlights, they last longer than most other kinds at around 50,000 hours. These lights are also moisture proof thanks to the small escape hole built-in. They’re bright but the lumen rate could be increased to match that of other brands. There seems to be some debate over their legality in the US. However, they’re 100% legal. Some law enforcement officers will stop you to check, but if you show them the right documents, everything should be fine. This halogen headlight will provide you with extra clarity when navigating through the darkness or poor weather conditions like fog or rain. These high-performance bulbs will provide the best vision on all areas of the road ahead of you. These bulbs are robust and can survive the harshest of journeys in any element. It’s safe to say that this branded headlight is a trusted manufacturer for almost 100 years since the creation of the car so you can trust these lights in your RV. The waterproof and sealed casing will provide the best protection against anything that might damage the bulb. These casings are even more protective than those used by LED headlights. This type of headlight is one of the most robust and durable headlights you can find on the market. They’ll be able to provide extra clarity on the road than your previous bulbs and that’s a fact. They come from a trusted brand that’s been operating for over 100 years. The sealed casing provides a waterproof and dust proof protection. The only downsides to this product are that they’re becoming unpopular and replaced with LED lights. They also don’t last as long and need changed more regularly. They might be durable but their life expectancy just isn’t the same as an LED headlight. There are quite a few various types of headlights used in RVs that have a few minor differences and alterations. The following section will discuss the different kinds. The most widely used pair of headlights and are just your box standard. They’re described as a forward facing bulb within a reflective box. They’re mostly known as halogen lights and are the most popular type of headlight on the market. This same design has been used for the past 100 years. These headlights are fairly similar to those halogen headlights. However, they feature a rear-facing bulb that illuminates the reflective case of the headlight which then creates a brighter beam of light. This laser technology is the next big leap in headlight technology. The way this headlight works is by using a laser to create a gas that then produces photons which is similar to how the HID lights work. These headlights allow for various designs and shapes to made, far more than LED lights, which makes them more versatile. They emit 1000 times the energy at a small cost. This type are some of the most energy efficient on the market. They’re also some of the latest and most popular currently selling as they can be crafted into various shapes like you see on new model cars. These lights also last longer than any other out there. This stands for High Intensity Discharge. These lights are some of the best for visibility at night or during poor weather. They use a gas called Xenon which allows it to glow so brightly, you’ll recognize them mainly from all those times other drivers have almost blinded you with a bright blue or white headlight, that’ll most likely be a Xenon headlight. There are a few steps to take in order to install your new headlights. If you go ahead and follow our advice you should do just fine. You’ll need a few tools before doing this, make sure you have a square bit and an electric screwdriver. Start by unscrewing the headlights that are currently installed by opening up your bonnet. There should be three screws for each headlight, two at either side and one beneath the headlight. 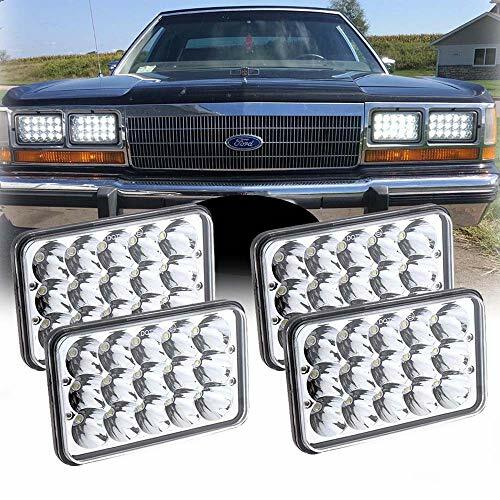 You simply take these out along with the headlight and disconnect any wires along with it. You then just put the new headlights in and reconnect the RV wires back up to the new headlights. You’ll then want to test them out to make sure they work. There are plenty of options when choosing your next headlights, you’d never expect to have such variety. However, it’s important you choose the right lights for you and the way you travel, there are plenty of benefits and just as many downsides that come with each type of light. We hope that are lineup and research has helped you in your decision. An important section for many readers is the FAQ section of our article. We have compiled all of the most commonly asked questions and answered them the best we can. We hope this helps. What is Better LED or HID Headlights? To answer this question we would need to provide you with the various pro’s and con’s and allow you to decide yourself. There’s no clear answer here on which variation is better. The LED headlight will last you a lot longer than any other light, they’re also crafted in a far nicer looking way than any other type. However, this doesn’t always matter, they’re there for visibility not how nice they look. HID headlights will give you the best visibility when driving at night or during bad weather. However, you can easily blind other drivers if not used carefully and will run out faster. What is the Best Color For Headlights? You’ll want your headlights to emit a color that’s white as possible. Any bulb with a Kelvin rating of around 4000k for Halogen bulbs or 5000K for HID/Xenon bulbs are the whitest. Are LED Headlights Brighter Than Xenon? Xenon bulbs are usually the brightest and provide the best visibility because of the Xenon gas that it uses. LED lights aren’t the brightest out the two. However, they’re the longest lasting lights on the market and the most popular. Xenon lights are also far more fragile than any other type meaning they’ll break easily.